Why not expand the entire electoral process by encouraging the formation of more parties. What choice are two parties? The purpose of the presidential debates is to continue this political professional wrestling through the elections. The orange-haired guy is scripted to lose to H. Clinton. That’s why you won’t see third-party candidates onstage. Heck, you hardly see them in the news. 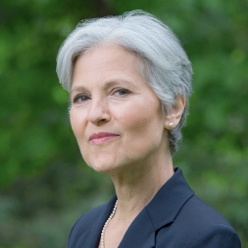 Polling at 15% gets Stein and/or Johnson into the debates. others that the question asked “Who would you vote for?” is biased. 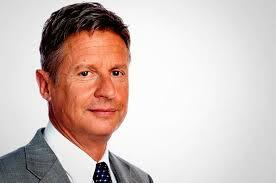 Then, from what I have read, the 3rd party candidates would be in the debates. I had supported the 15-percent threshold until I read this article, with it saying that Jesse Ventura had jumped from 10 percent to 37 percent after being included in the debates, and after thinking, “Why does it have to be 15-percent?” I then realized that every candidate, no matter what their polls are, should be included in the debates, and before I started writing this, I realized that the debates with every candidate included should be MANDATORY, unless a candidate refuses to debate due to health or a principle – like refusing to participate in a debate with people whose policies he despises. Although I’m voting Green, there are probably a half-dozen different ways to solve our democracy deficit problems, societal problems, economic problems, etc…with the proposed programs of several good minor parties out there. The REAL problem, however, is HOW to take power away from this crime syndicate that we call “The Establishment”, and place the power-to-rule, in the hands of (in my case) the Green Party & Dr. Stein?, without an ensuing, bloody, godawful war?? I have no doubt that we will NOT be shown the real results of our voting; that the crime syndicate will MAKE SURE the voting reflects what THEY want. What to do about this problem? It didn’t work out too well the last time there was a crumbling of “The Establishment” during an election; I’m referring to the 1860 election. It’s so farcical as meant to be. One cannot run a ruling class society without being a scam. We really need more than just another political party or more open debates. Sure, these would be interesting and they might get more people engaged, but the problem with our political system is deeper than that and we need structural reform to eliminate the two-party duopoly. The two dominant political parties do not think they want such change – after all the two-party system is working to keep them in power. But the recent nomination process, particularly on the GOP side, should give them some pause. Surely there must be some better process than the one that has turned the next general election of president into a contest between two candidates who are so widely disliked. A problem – and I would judge the most significant problem – is our continued used of plurality voting. Plurality voting cannot be depended on to make a reasonable, democratic decision from among any more than just two candidates. This is the spoiler effect and the nomination of Trump illustrates how bad a selection can result from it. There are better ways we could vote and using one of them could make a huge difference in our politics – and give us more open debates. I looked up the criteria for inclusion in the Fox Republican primary debates. In order to qualify for the primetime debate, candidates must place in the top six spots nationally in an average of the five most recent national polls, or place within the top five in Iowa or New Hampshire in an average of the five most recent Iowa or New Hampshire polls recognized by FOX News. In order to qualify for the early debate, candidates must register at least one percent in ONE of the five most recent national polls recognized by FOX News. Any of the big Corporate TV Media could easily sponsor a 4-way debate if they wanted to. I wouldn’t expect such invitations to go out, and in the unlikely event they did, I wouldn’t expect Hillary to show up. She would look mighty bad when contrasted with Stein. How can such an undemocratic system survive in the presidential debates, requesting 15% support for the candidate? How can they ever get this support if they are not allowed to present their ideas to the American public? It seems obvious that all four candidates should be included, and perhaps even the phony neocon Romney stand-in who will probably take more votes from the harpy than from Trump, anyway, since those who would vote for him would probably not support Trump, but will enjoy an excuse not to vote for the long-hated harpy. Crooked Hillary Clinton is going down like Monica. Probably not. Michael Moore claims to have some ‘insider’ information about the past and future of the Trump campaign. While I have grave doubts about his claims of Trump’s original motives, (I figure he was bought by the Clintons) Trump’s future looks gloomy. No matter why he got into it, he surely needs to be out as soon as possible. Perhaps there are some deep negotiations going on between him and whoever passes for Republican leaders these days. They throw him out kicking and screaming in which case he becomes a martyr, or he suddenly has health problems with his 70-year-old body. Guessing now, if they ease Pence into the top position, Hillary beats him like a drum. Ditto if any other of the “Big Name” boys are given the lead, same result. Finally, virtually any US citizen over 35 years old who opposes the TPP, says he/she wants the US out of the Wars for Israel, and promises to do whatever it takes to stabilize the US economy would beat Hillary. Since I don’t think the Republicans want to ‘win’ this year, I believe they’ll pick a guaranteed loser. After all, Hillary is about as much a Democrat as Obama. Which means not very much. 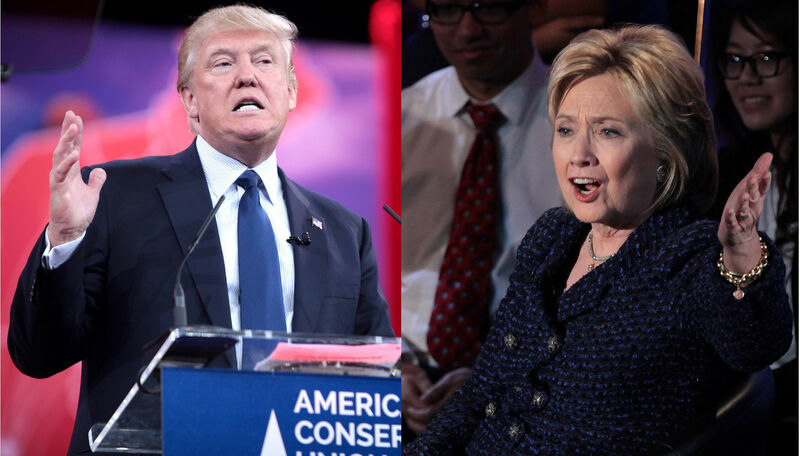 Trump and Jill Stein lead Hillary in ONLINE polls. The other polls with Hillary leading are FAKE. 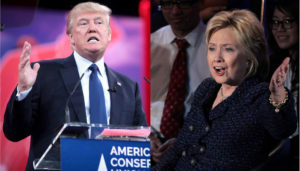 ELECTION ABC LIVE POLL: Who Are You Voting For? Watch out for electronic voting machine FRAUD and voting fraud during the general election to favor Hillary. Vote for Dr. Jill Stein of the GREEN PARTY for President and Ajamu Baraka for VP. Be aware that – in essence – there are NOT ten networks. With the existing media dynamic, more debates would not better inform the citizens. Most needed is a drastique change in candidates from ego-driven to community-driven leaders.